- Debuting at Caspian Ecology, we hope that the event will help find partners for the upcoming promising projects of our company, as well as to establish cooperation with companies that can provide us services on the latest, "green" technologies. There were several useful meetings at the exhibition, and there will be more talks in the near future; so the current event is really benefiting us. Thanks to Caspian Ecology 2018, we have gained a favourable opportunity to advertise ourselves as a new joint-stock company which was established under the Decree of President of Azerbaijan Ilham Aliyev on February 11, 2015. The company is currently engaged in the study, research, exploration, development and management of the gold-bearing and iron-ore fields of Garadagh, Chovdar, Goydagh, Daghkesemen, the Kohnemeden site and the Kyurakchay basin. 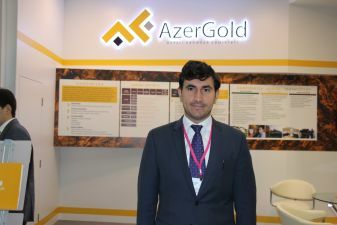 The main work is now being conducted on the Chovdar field of Dashkesan region in Azerbaijan; the technologies we use there for the extraction of gold meet international environmental standards. We have developed a special environmental policy, under which employees of our company periodically plant trees and clean the soil.